Just in time for the dog days of summer comes along a great adventure show, 500 years in the making. Treasure Quest: Snake Island is a new TV series airing on the Discovery Channel that boasts of an elite team of treasure hunters, searching for hidden Incan gold somewhere along the Southeastern coast of Brazil that’s been lost for 500 years and worth hundreds of millions of dollars. According to a radical new theory, it’s hidden on Snake Island, a place that just happens to have the highest density of venomous snakes in the world! As the legend goes, back in 1524, conquistador Aleixo Garcia plundered a massive loot of Incan gold — aka The Treasure of the Trinity — that was later recaptured and hidden by the Brazilian locals at the most isolated and desolate place around: Ilha da Queimada Grande (also known as Snake Island). Many people have been unsuccessful at finding the treasure, oftentimes dying from poisonous snake bites. Part documentary, part action-adventure, the crew tries their best to keep a low profile, with help from Jeff Cavendish, a local Land Fixer, who helps them attain proper permits (which can be quite tricky for outsiders to obtain). Before stepping foot on the island the team seeks proof that an actual treasure is nearby, so they start searching for nautical evidence from the 1500s, searching for shipwrecks. As soon as something is discovered, a new type of threat appears: modern-day pirates. Combining elements of Indiana Jones with Pirates of the Caribbean, this seems like a mission for Josh Gates (of Destination Truth and Expedition Unknown fame). Cameras are taken everywhere, from the flashbacks filmed before the crew’s journey, to overhead swooping views and even taken along during underwater dives. Future episodes tease of spelunking in caves and being chased by real-life pirates. After watching the pilot episode, an eventual Who’s-the-Boss confrontation between Cappy and Graham seems inevitable, in a battle for control. Both very interesting and fun, this series is quite enjoyable (although the ancient legend this crew is chasing may or may not be true). 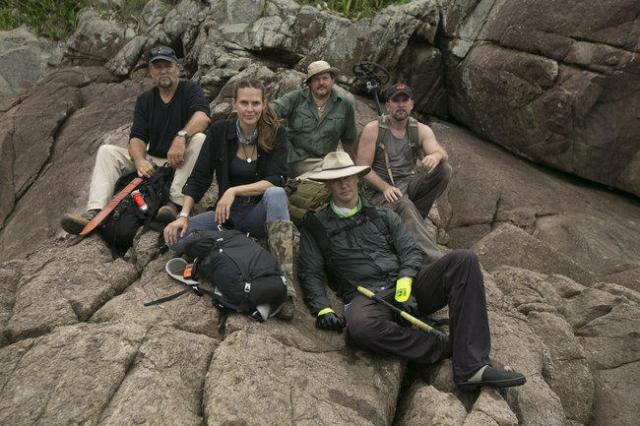 I just hope the team makes some sort of discovery (pun intended) before the six-part TV show ends (unlike Legend of Superstition Mountains, which was prematurely pulled off the air before its season wrapped). The crew will face many risks, dealing with sunken ships that litter the open sea, bad weather, limited resources, along with a short time frame before someone else discovers the loot. But the worst risk of them all is motion sickness, which the viewer will surely get, after watching each episode’s shaky camerawork, trying to film while working on a boat. Now that this TV show has aired its first episode — did they actually find any evidence? — there’s sure to be many more real-life treasure hunters flooding into Ilha da Queimada Grande. Here’s to hoping one of those treasure hunters has a camera with them to document their finds! Strength: Interesting subject matter based in an exotic location. Weakness: Is this possibly the first “real” reality TV show? WTF Moment: In 1852, a mysterious old map appeared in India, which this crew is using. Is this real? If so, does anybody else know about it? And where the heck did it come from?